When Ben Edlund joined the writing staff of the Batman prequel show Gotham some months ago, it was an encouraging sign. Besides creating The Tick, Edlund wrote some of the best Firefly, Angel and Supernatural episodes. And his first credited Gotham script is also excellent. In fact, "Spirit of the Goat" is not just a terrific episode, it retroactively makes everything that's come before better by association. We caught an early screener of the episode the other day, and we're happy to report that it's a classic piece of Edlund-style weirdery. With so many great quotable lines and funny bits, the GIFs will basically create themselves. Without going into any real spoilers, suffice to say that "Goat" is largely based around Harvey Bullock, and Edlund uses the awesome talents of Donal Logue to full effect. Harvey's character takes a massive leap forward in terms of complexity and sympathy, without losing any of his dirtbagitude. 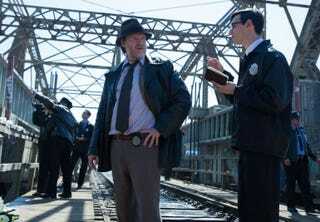 The relationship between Harvey and his partner Jim Gordon is also used to terrific effect. But also, some of the stuff that's been troublesome about Gotham works better in Edlund's hands, including Edward Nygma as the quirky CSI tech who crops up in every episode with a terrible riddle. The show's child version of Bruce Wayne has his best scene yet, by a large margin. And even Barbara Kean gets considerably more watchable. Plus the best part of the show, the Penguin storyline, has some marvelous bits. All in all, it's not entirely surprising that the guy who gave us The Tick would have some of the best ideas for how to handle a Burton-esque vision of Gotham City before Batman. But if you've been wanting to dip your toe back into Gotham for a while now, this is the one to do it. Just a heads up.